While I made Iceland my primary destination, a lot of people make a stopover there on their way to or from somewhere else in Europe. 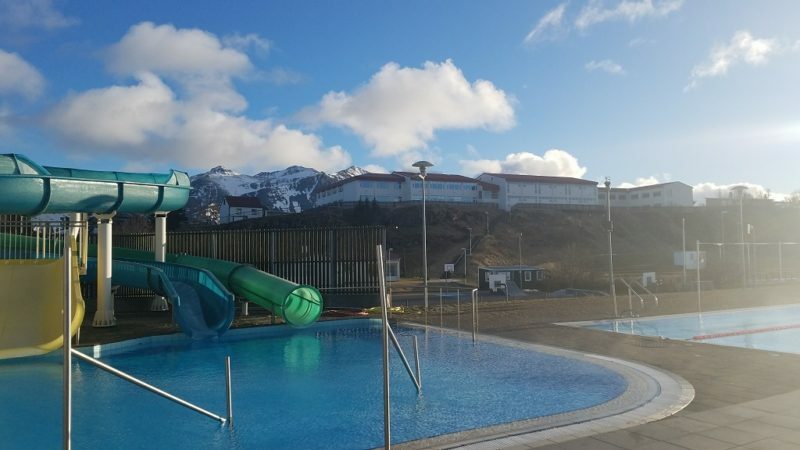 Thanks to Iceland Air’s promotion of a free stopover for up to a week,you can dip your toes into the magic of Iceland, as part of a visit a more affordable country. The reality is that Iceland has so many offerings that cost a bundle that, if you are not careful, you can go overboard. My travel style often involves having some very budget minded days while mixing in a few experiential splurges. A budget day often involves city strolls, ambling through villages, visiting a small museum, hiking in nature, and cooking my own meals. The types of splurges I like to indulge in are special meals, thrilling outdoor activities that require a tour guide, and a spa or self-care day. In planning for Iceland I came up with a list of experiences that I thought would be well worth the time and money. I am thrilled to report that all of them became highlights of my trip. I loved every moment of them. It is located near the airport, so almost everyone goes right before or after their flight. I planned my visit for the day I arrived, since I know that I am not operating at full capacity for a day once I step off an international flight. I was in the milky blue lagoon while it was still dark and I have to tell you that watching the sky turn pink and illuminate the snow-covered lava rocks that surround the lagoon was incredibly special. The innovators have thought of everything. A bar serving drinks in the lagoon, so you need not get cold and out of the water to refresh yourself. And another bar in the lagoon that served up supplies for facials. Floating around wearing silica masks and algae masks was so much fun. If you are coming from the airport, do consider making advance reservations to eat at the Lava Restaurant. Enjoy fresh fish and tender lamb prepared and served with care, while you eat in your bathrobe and overlook the lagoon. The Blue Lagoon rocks! 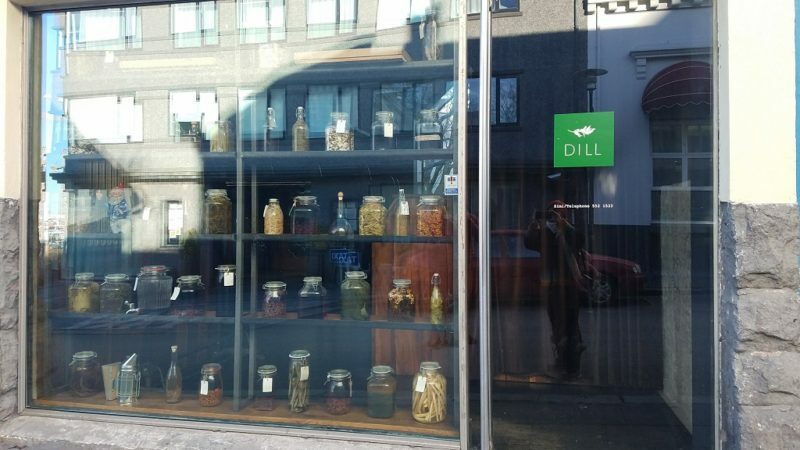 Speaking of fresh food prepared and served with care, Dill is Iceland’s only Michelin starred restaurant. It is deserving of such an accolade. 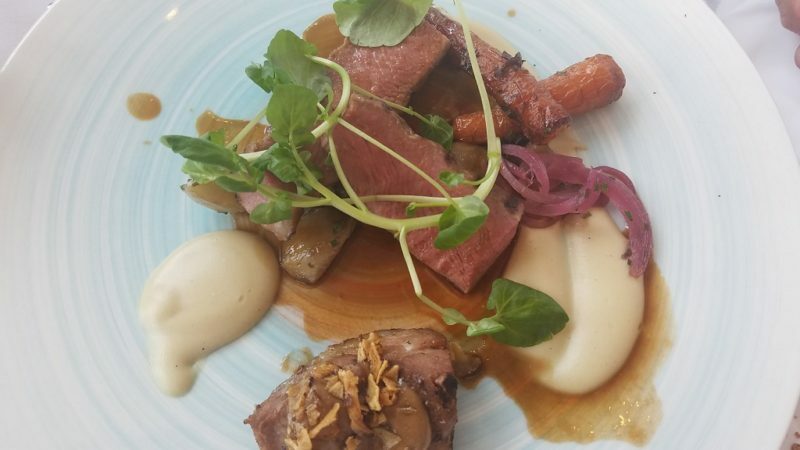 If eating an upscale meal is not all that important to you, then skip this splurge. But if you are a lover of fine food, then Dill will be a reminder of all that is yummy in the world. The décor is earthy and subdued, employing darker colors and dim lighting. Yet it is a very unpretentious setting. 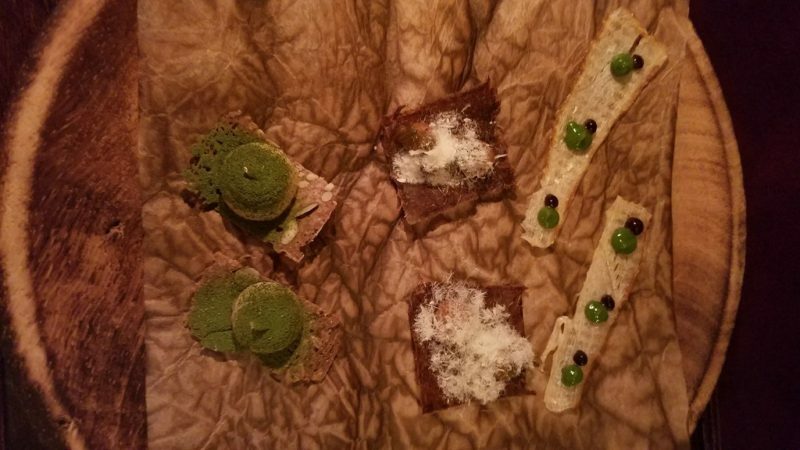 The chef, Ragnar Eiríksson focuses on fish, with one course of beef to round things out. Iceland is not blessed with prime agricultural land. Eiríksson made up for that by being very creative using root vegetables. He transformed the ordinary sunchoke, parsnip, and rutabaga into something extraordinary. Roasting, drying, frying and pickling were all in his repertoire and sometimes the same vegetable would be prepared several ways, even within the same dish. I had read about the fissure before I went to Iceland and assumed that it was not accessible to me in the winter. 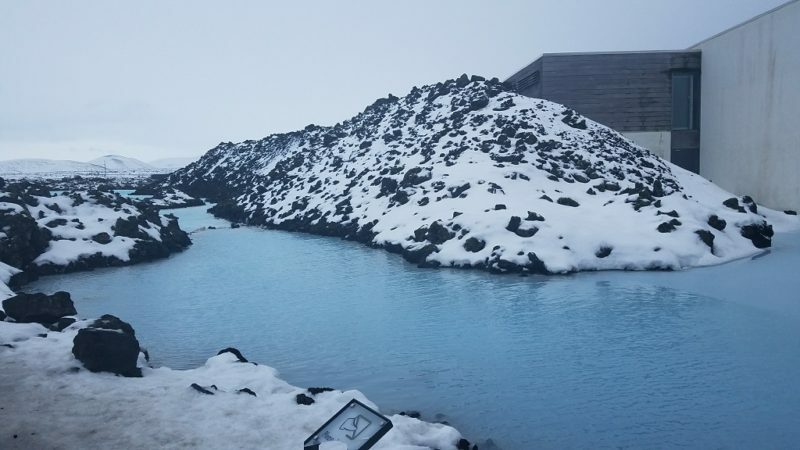 I am happy I spoke with a man at the Blue Lagoon who had just done it and said that with the dry suit, it is offered all year long (the water actually is the same temperature year round). Well, that was all I needed to move forward. I did a little research online and signed up through Iceland Adventure Tours, for the day I was doing the Golden Circle. 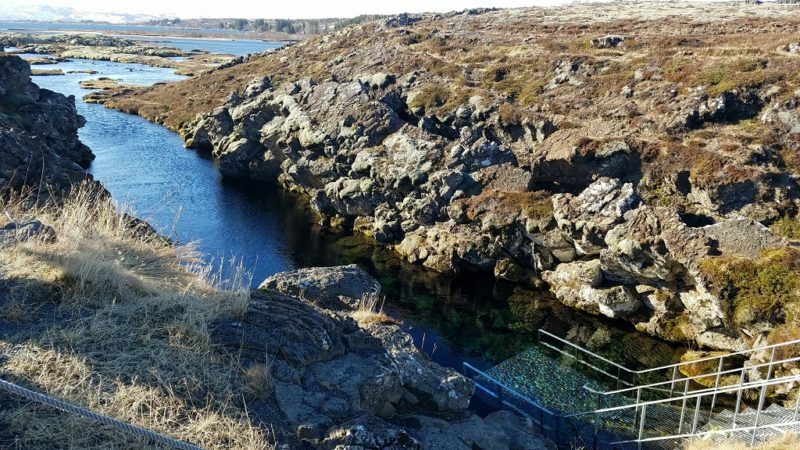 The Silfra Fissure is at the first stop on the Golden Circle, Thingvellir National Park. 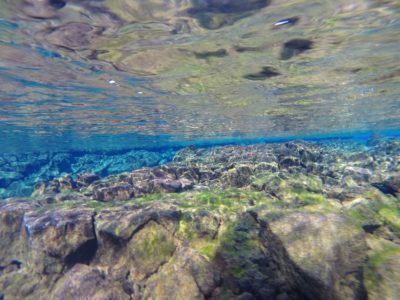 I have snorkeled plenty of times in the tropics to see the fish, but I had not yet been crazy enough (or had the opportunity) to snorkel in 35 degree water before. 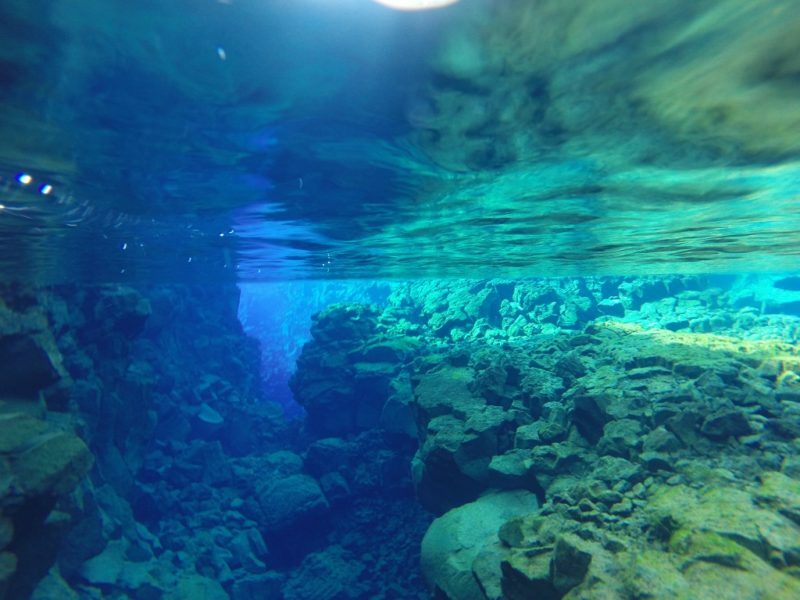 The real show stopper in Silfra Fissure is that you are floating in a waterway (sort of like a narrow river) in between two tectonic plates that are pulling apart, at a rate of about one in a year. It was a tossup for intrigue between the volcanic rocks that appeared to be teetering on top of each other versus the clarity of the glacial water all the way to the sea bed. The icing on the cake was how blue everything looked. So many different shades! Picture all your blue Crayola crayons painting an underwater scene to rival Van Gogh’s Starry Night. Midnight blue and sky blue and turquoise and aquamarine and cyan and indigo. The most uncomfortable part of the whole three hour tour was getting dressed and undressed. There are lots of steps and the guides will ensure that you properly equipped for the cold water. Once you are into the water, the cold is barely an issue. Your hands and face will be chilly and your body will be very comfortable. In fact, you won’t really want to get out when it’s time! But before you do, make sure to drink the water. It’s been filtered through lava rock for 30 years, and I promise you it’s the best water you will ever drink. 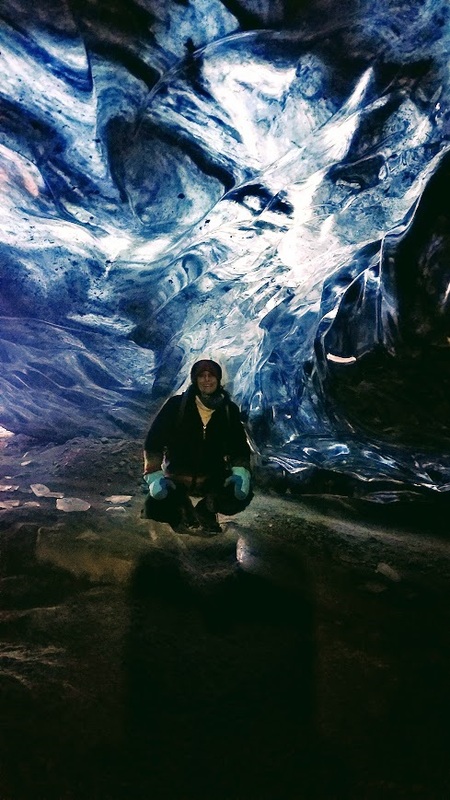 I did not actually do any glacier walk tours in Iceland. 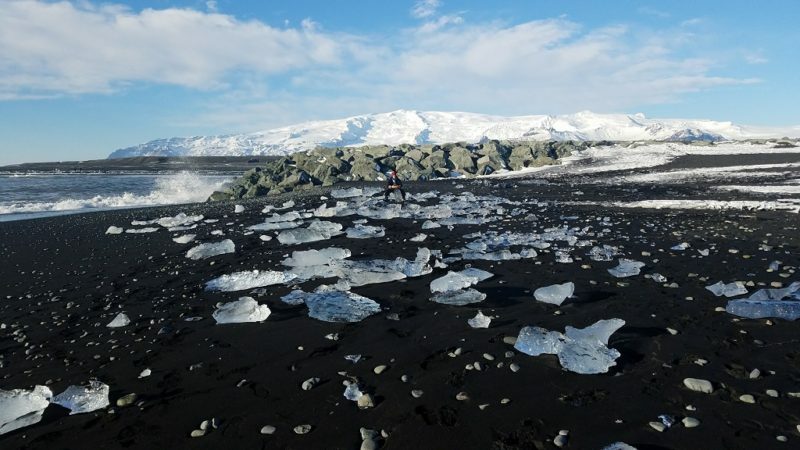 I walked on land to reach the tongue of Skaftajökull Glacier. 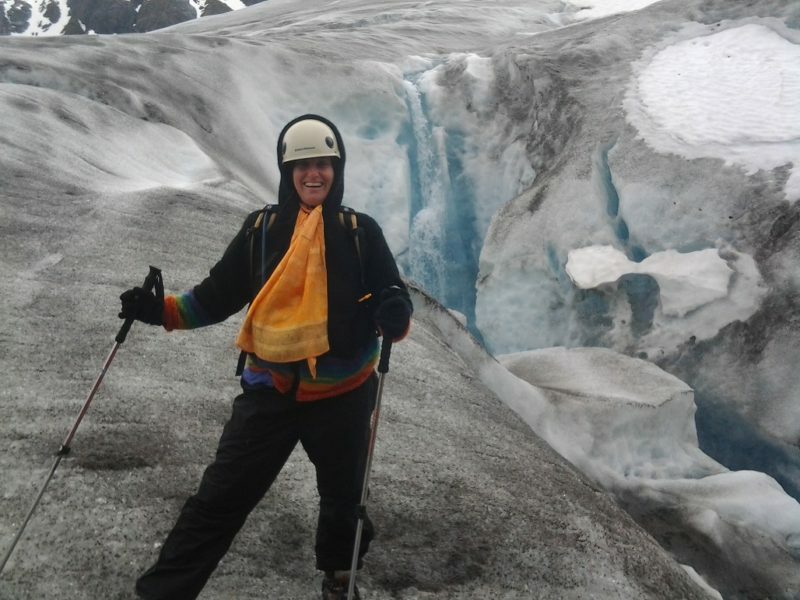 And I have done glacial walks in Alaska, which is where I first began to understand what amazing creatures glaciers truly are. I see that many companies are offering tours for about $100. And relative to what things cost in Iceland, that is a very reasonable cost. If you get an enthusiastic guide, you will be elated you did it. There are a few more things that really felt like splurges, yet are very reasonably priced. They deserve a nod. Laugar Spa is possibly the coolest spa in the world, certainly the coolest one I have ever been to and I’ve been to some cool ones! It is in the city of Reykjavik and part of a larger complex that serves the broader community as well as tourists. A world class gym is at the core of it. So many weight and cardio machines, you won’t know where to start. They have fitness classes as well. 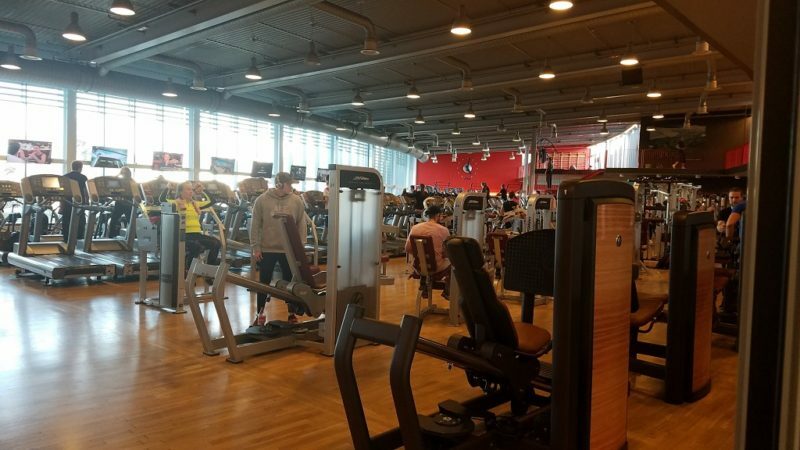 For as active as I am while traveling (tons of walking and hiking), I really appreciated an actual gym where I could lift weights. But the out of this world experience is downstairs, in the official spa where you will be given a lock for your locker and access to towels and bathrobes. You enter the spa by iris recognition (from upstairs where they screen your eyes) and then the door opens to a dark and serene space with more spa amenities than you can imagine, or that you will have the capacity to experience. The spa is arranged along a long corridor. The walls are all black, much of it tile and stone, and the amenities open to your left and right. There is a hot tub, with sensually shaped smooth rock chairs in it. There are four wooden saunas, all set to different temperatures. Two steam rooms, with very intricate tile work, also with sensually shaped chairs and foot rests inside. The slow and steady hiss of steam is soothing to the mind as well as the body. Since you will be getting plenty of heat, you will be grateful there are some stations where you can cool off. Tubs to submerge yourself in. Or the black curvy rocks you can sit in and cool off your feet in the shallow pools with the backdrop of the waterfall that gently cascades down into the pool. How amazing is that? Of course, and thankfully, there is a café, as the exposure to this much heat will have you begging for a smoothie and salad. Maybe the most interesting room is the one with a gas fireplace in the middle and about 20 lounge chairs circling it. It is cozy and warm, but not hot like the sauna. Beautiful music envelopes you as you lay back mesmerized by the fire. For a double splurge, consider adding in a massage or body treatment. You can hang out in the spa and the massage therapist will find you when it is time. Then you can retreat back to the spa for additional luxuriating. The spa is open from 6 AM to 11 PM. 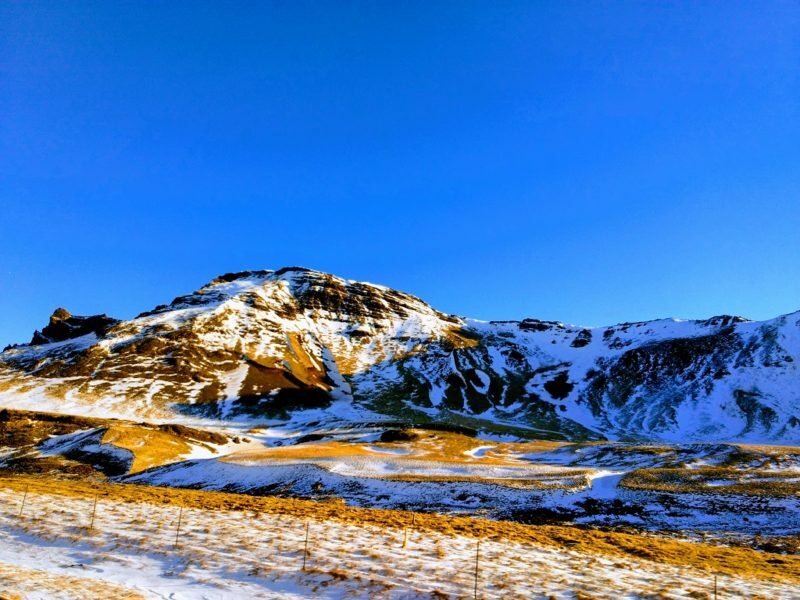 Certainly you won’t be able to immerse yourself in heat and water for that long, but plan on spending the better part of a day here to fully experience what makes Iceland so special. First off, I promise you this is no lackluster sushi joint where you are scared to consume whatever is coming down the conveyer belt next. I’ve made that mistake before. 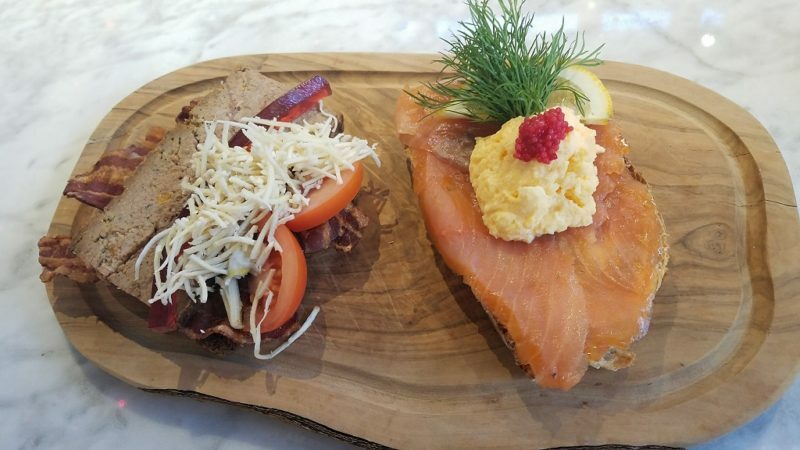 Rub 23 is a darling little restaurant in downtown Akureyri serving excellent nigari of arctic char and Atlantic salmon to name a few. And sushi rolls with tuna, salmon, and super fresh veggies. And an array of cold dishes that will make you wish you had three stomachs. Arugula salad, whole cod decorated with a basil sauce, interesting grain dishes and so much more. They also serve dinner, which I have no doubt tastes fabulous. 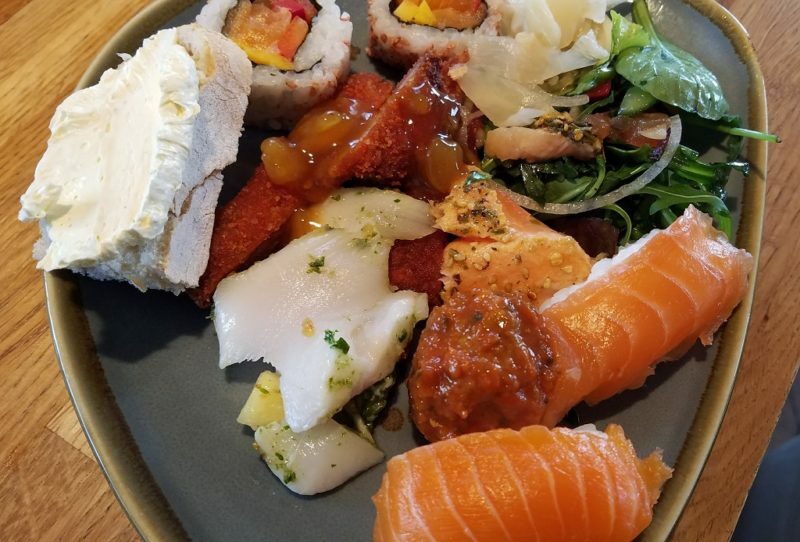 But splurging on the sushi bar for lunch is a great value. Because Icelanders consider this to be part of daily well-being, not a luxury, they are totally affordable. I almost didn’t list them. They are part of the social fabric of the culture. Teenagers flirt, neighbors chat, babies learn to swim, and everyone rejuvenates themselves as they take in the water. It’s an old age tradition that has stood the test of time. Almost every town has them. I had fun going to as many different ones as I could. They are not posh (although they are very clean), but the abundance of warm water feels very luxurious. They all have swimming pools which are bath temperature, and at least a few hot pots and steam rooms. While the private spas for the tourists are fun, if you want to taste the local culture, you need to do like the locals do and hit the public pools. The fire and ice make for memorable splurges in Iceland. Make sure that you try some of them!